Video still of Doylo climbing Big Trouble in Little China 7B+. Image: Doyle collection. 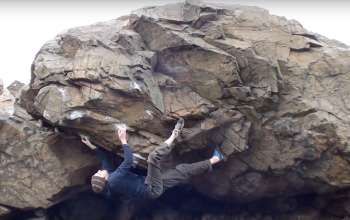 Back in January Chris Doyle (aka Doylo) developed (or perhaps re-developed) a great Dumbie Rock lookalike boulder on the second level of Penmaenbach quarry near Conwy (under the Tommy Chamonix 8a slab route for any route-heads reading this). Doylo wasn't sure what had been done before but, in the absence of any information, has named and graded 7 lines from 6B to 7B+. Chris reckons it must be one of the quickest drying boulders around - useful in the recent monsoon period we have all 'enjoyed'. Visiting with Doylo, Si has done an additional line following the obvious leftwards rising traverse from just left of the 6B to the highest point of the boulder. SDS lh on the rh hold of the 7B and rh in the lh hold on the 6B start. 7A/+ powerful and tenuous - great problem. (This description should make sense after you watch Doylo's video below).